Muscle Memory or MC Memory … that is the question..
Well this week, I have been inspired by Salvador Dali and his paintings. He declared himself a genius and I would have to agree. The man had a gift for tapping into the sub-conscious and dreaming states. 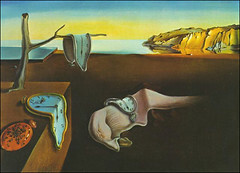 Salvador Dali is perhaps the most recognised and famous of the surrealist artists of the early 20th century. He produced over 1500 paintings in his lifetime. The most famous of these paintings was titled: The Persistance of Memory. In it the most recognisable feature is melting clocks. There have been many interpretations of the inspiration behind this painting. The most accepted inspiration was Einstein’s theory that time is relative and not fixed. This theory fits in perfectly with the surrealistic movement. Legend goes that he was inspired by watching melting camembert cheese. If you have not seen the painting, The Persistance of Memory, google it or better yet go the Museum of Modern Art in New York City and view it. It is truly a fascinating painting. This painting is one of my favourite paintings. Whenever I look at it I find something new in it to inspire me. So for this week’s Monday Mental Muscles I am going to get you to exercise the muscle of memory. Memory is something that forms who you are. You learn from past mistakes. You remember circumstances that make you happy. You remember the sound of a voice of someone you love. Memory has the rare ability to allow us to travel through time and space for a moment. Memory and Dreams are connected. Our dreams are rooted in our memories of the day’s happenings or memories that haunt us. In the same way story telling uses our power of memory recall to flesh out our characters and to make a story livable and believable. Memory is intangible. Memory is fluid. Memory is changeable. Memory is subjective to the emotions we have at the root of a specific memory. So using the inspiration of The Persistance of Memory where time is relative and unfixed along with the fluidity and unpredictability of human memory I have come up with some writing exercises for you this week. Of course the rules again: are that you do at least one of these writing exercises this week; that if you blog about them, link back to this blog; and lastly but not leastly that you feel free to pay it forward by passing on these exercises to other people. Write an essay of a childhood memory but focus on the emotions that you felt as a child at that time. Write down a memory of your main character and how that memory has affected their personality. Write down the first memory you can ever remember and then close your eyes and imagine yourself back in that moment. Hi Kim…I think I am turning a huge fan of monday writing muscle. What wonderful exercises. For my creative writing classes, my students wrote an essay on Favourite Childhood Memory. Are you tweeting these posts? I think everyone needs to read about them. Thanks my friend! Glad you enjoy them. And yes I am tweeting these posts.